While I struggle to sift through the 400+ photos I took in a week in Thailand I thought I'd share with you all a book that surprised me in all the right (and sometimes wrong) ways. 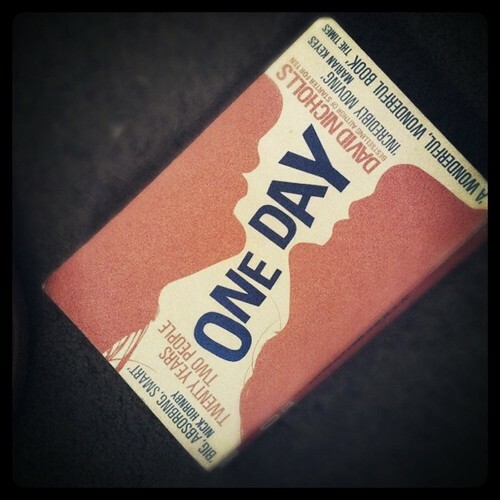 I began reading "One Day" by David Nicholls on a beach in Koh Samui and from the first few pages I was hooked. I lay on a recliner in one of the most beautiful places I've ever been to with my head firmly buried in this book. It's not often I get completely engrossed in a book, there's usually something that loses my attention - whether it be the writing style, something the character does, a plot change - and I'll read to the end but not feel fully satisfied by the ending. This book is so beautifully written and composed that by the end of each chapter I was nervous/excited to find out where they were a year later in their lives. That's the beauty of this book - each chapter is based on one day each year and you get to see how Emma and Dexter's lives are evolving and changing through David Nicholls brilliant descriptive writing. By the end of this book I was so emotionally involved in these characters that I found myself laughing and crying and feeling proud and sad and happy and every emotion that they felt along with them. A movie has been made based on this book starring Anne Hathaway and Jim Sturgess *swoon* and I'm excited to see how they do it. I'm so happy I read the book before seeing the movie because I don't know if I would hold the same appreciation for the book that I do now. If you only read one book this year, I suggest you pick up a copy of this one and read it from cover to cover as quickly as you possibly can before the movie comes out. I cannot wait to read his other books. Thank you so much for this! I was wondering what all the fuss was with this book, but I never really read a review-- I'm excited to read this! I just got chills watching that trailer! I am going out and buying this book immediately!!! I can't even wait to begin! Thanks! going to add this to my reading list. Great review on it. Sparked my interest! Ok you kids are too nice. It really truly is a beautiful book - you won't be disappointed!!! !